ST. ANN, JA/NEW YORK, NY (Ms. RAINE INC.): Oracabessa’s 007 All Stars Football (Soccer) Team are gearing up to square off against the celebrity-studded ‘009 Ocean Splash Celebrity Team for the much anticipated Ocean Splash ‘009 Celebrity Soccer Match and Concert. Slated for James Bond Beach in St. Ann, JA on Sunday, December 20th, the highly anticipated Ocean Splash ‘009 hopes to draw sports and music fans to a fun-filled beach party, complete with live sports, music, performances, and giveaways. Led by Team Captain Snagga Puss, the ‘009 Ocean Splash Team, which includes Spragga Benz, Aidonia, Anthony Cruz, Mad Cobra, Tony Curtis, Prestige, Captain Barkey, Wickerman, Mr. Lexx, Mega Banton, Mr. Peppa, Nesbeth, Kashu Man, Vybrant, I-Octane, Ronny Twaites, Teacha D, Higher Boukie, Many More, Quench Aid, Stikki, and Blacka Pride, plans to leave the local 007 All Stars both shaken and stirred in a no holds barred Football showdown on the famous white sands of James Bond Beach. "Jamaica is known worldwide for excellence in both music and sports," states Ocean Splash promoter and organizer Tasz Smith of Triple T Production. "Ocean Splash wraps both music and sports together for a day-long celebration that is guaranteed to satisfy people looking for a good time and a great event to kick off the holidays." In addition to the Celebrity Soccer Match, Ocean Splash features a wealth of entertainment, including DJs Slim-J and Fire 20 and dancers Dyema, Iyla, Marvin, and Back It Up from Montego Bay’s famous Dutty Fridaze street dance. Prizes and giveaways will be distributed throughout the event to several lucky patrons. Prizes include everything from CDs and t-shirts to flat screen televisions and stereo systems. The day-long beach party will be capped-off with live performances from Tanya Stephens, Anthony Cruz, D’Angel, Prestige and Terry Linen. 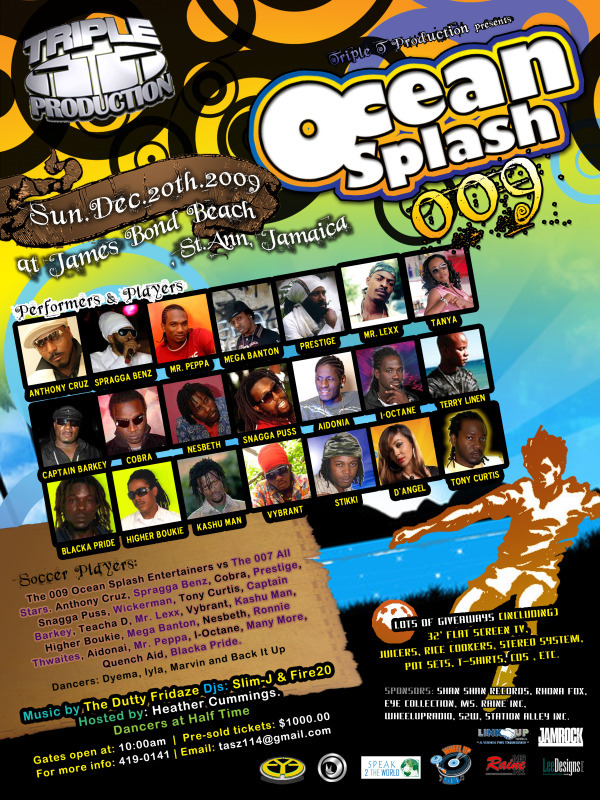 Ocean Splash ‘009 will be held on Sunday, December 20th at James Bond Beach in St. Ann’s, JA with Tanya Stephens, D’Angel, Terry Linen, Spragga Benz, Anthony Cruz, Aidonia, Mr. Lexx, Mad Cobra, Captain Barkey, Wickerman, Snagga Puss, Tony Curtis, Mega Banton, Mr. Peppa, Prestige, Ronny Twaites, Teacha D, I-Octane, Nesbeth, Stikki, Vybrant, Quench Aid, Kashu Man, Higher Boukie, and Blacka Pride. Ocean Splash ‘009 is sponsored by Eye Collection, Station Alley Inc., JAMROCK Magazine, Shan Shan Records, Irie Dale Inc., Twin Thumb Wireless, CWCtv, Dancehallreggae.com, Rhona Fox, Inc., and Ms. RAINE INC.